お元気ですか？(O-genki desu ka?) Vous allez bien? Dje si? Shnoo ahwalak? Wherever I travel, I like to think about linguistic nuances that reveal something about a culture, and sometimes even about human nature. While every place has its own version of “How are you?” and other common greetings, there are some places that add a distinct and interesting twist. In Japan, “O-genki desu ka?” asks not only how you are, but also whether you have good health, energy and spirit. The French likewise often eschew the open-ended “How are you?” for the more to-the-point “Are you well?” In Bosnian, you might hear the informal greeting of “Dje si?” or “Dje si ba?” meaning “Where are you/Where have you been?” And the Tunisian casual greeting, “Shnoo awhalak?” encompasses a wide-ranging concern about your well-being, asking “What are your emotional/physical/mental/spiritual conditions?” To me, all these variations of standard greetings reflect human nature’s desire to connect with and show concern for those we meet. When you think about it, every interaction is an opportunity to express a little bit of compassion & concern, regardless of how small the act might seem at the time, no matter how well or how little you might know the person. I think that on balance, as crazy as our world gets sometimes, we human beings have good will and wish our fellow humans well, and it doesn’t require much effort to do so. When we’re at our worst, perhaps we forget how simple and essential it is to connect with people and inquire about their well-being, extend a simple act of kindness, send them on their way a little happier. At our best, when we are able to take time to wish even strangers well with a heart-felt greeting, imagine what wonders we can do for our near and dear with just a little effort. 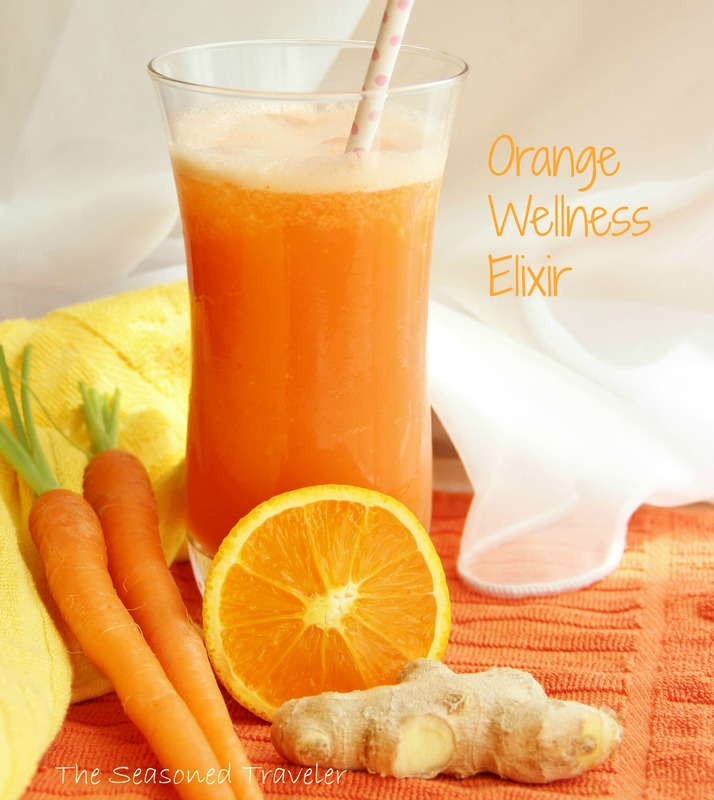 This Orange Wellness Elixir is similarly simple, effortless, and can do a world of good for your well-being if you’re not feeling at your best and strongest. It contains a powerful duo of spices for your health: ginger soothes and comforts, while turmeric boosts immunity, protects against disease and inflammation, and alleviates pain. 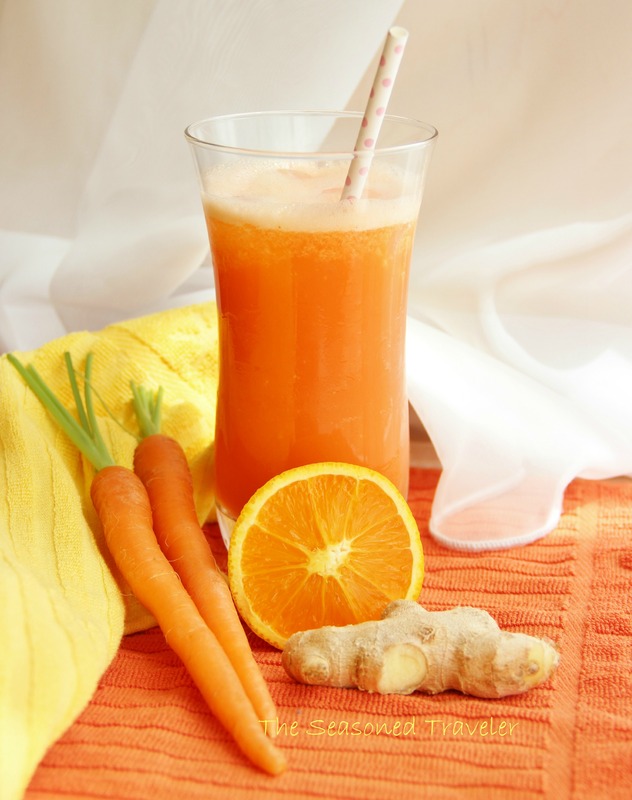 Orange and carrot juices, in addition to providing bright, soul-lifting color, also contain essential vitamins, nutrients and antioxidants. If you are sensitive to acids, this is not the drink for you, but you could make a different sort of ginger-turmeric wellness elixir by swapping out the juices for a soothing herbal tea or coconut milk. Otherwise, brighten your day with this vibrant orange elixir. Here’s my little recipe for you, my simple way of wishing you wellness, energy, health, a happy day, a good life. Come, sit, enjoy the here & now of this moment, and be well. Combine the juices, grated ginger, ground turmeric, and 4 ice cubes (if using) in a blender and blitz for a couple minutes until well-blended. Pour into two glasses and enjoy. This looks so refreshing…and nutrient rich! I think I will make this tomorrow. Thanks! Thanks, Serena! Hope you like it! I’ve just made this now. It beat a late afternoon sugar and coffee craving. Thank you! Such a refreshing drink. Must must have to try this soon. Perfect for summer. I feel health benefits just reading this, love it. I love the combination of ingredients. 🙂 Thanks, Suzanne! Funny how sometimes just taking a moment to do something simple for your health — even a moment of reflecting on it — can make us feel better. Hope you have a wonderful day! Such a pretty color and so nutritious! I love blender juices! I love all the healthy ingredients in this–it sounds so good! Fantastic, hearty drink, and beautiful message, Laura.